Yoyofriends is the brand from yoyo manufacturers, Fenghuida Precision Manufacturer Co (FPM) in China. These guys are a top machiner of yoyos that usually manufacture yoyos on behalf of other brands, but they do release their own from time to time. The Yoyofriends ElfinYo yoyo is a great-priced, quality delrin throw that was actually crowd-fun.. The Hummingbird is YoYofriend's latest (and greatest!) yoyo high-end super-premium offering for .. 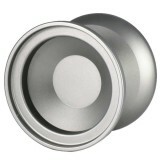 Following on from YoYoFriends insanely popular Hummingbird, comes their new mono-metal 7068 offe.. The Yoyofriends Pioneer is the first yoyo released from YoYo manufacturer Fenghuida Precisi..